Kingdom of God: Its appearance may be characterized by weakness and apparent insignificance – but remember the mustard seed. The day will come when the Kingdom of God will surpass in glory the mightiest kingdoms of the earth, for it is the consequence of God’s sovereign action. 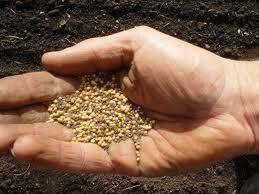 The mustard seed is the word of God proclaimed by Christ. This word possesses the power which one day will make all things new. When the glory of that manifestation breaks forth before men they will be as startled as the man who considers the tiny mustard seed and the mighty shrub. William L. Lane. The Gospel of Mark (The New International Commentary on the New Testament). 2nd ed. Wm. B. Eerdmans Publishing Company, 1974. 171-172.